Bill Haas’ grip matches his swing: well-balanced and efficient. It’s no surprise that the son of a PGA and Champions Tour pro (Jay Haas) would feature a fundamentally sound grip and swing. In fact, the younger Haas may be more technically proficient than his dad. 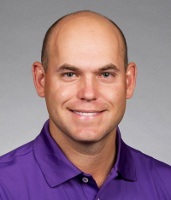 Bill Haas is a big guy (6’2”, 185 pounds) with big hands. 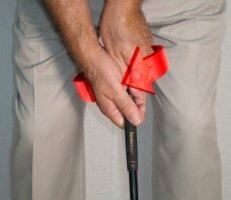 He wraps them lightly around the club, with perhaps a bit more finger contact between left hand and handle than you usually see. 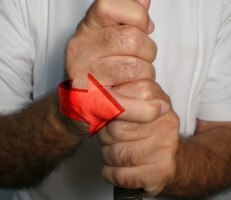 The back of his left hand points a bit right of his target, indicating its rotation into a strong position. Haas’ right hand is a mirror image – it’s tucked just under the club, the “V” between thumb and index finger directed just inside his arm to the shoulder. This solid grip has helped Haas become one of golf’s steadiest ballstrikers. He routinely ranks high on the list for total driving (distance plus accuracy) and greens in regulation. He’s a decent putter too, ranking on the plus side in strokes gained putting from 2011-14. On the greens, Bill Haas’ grip is soft and unified. 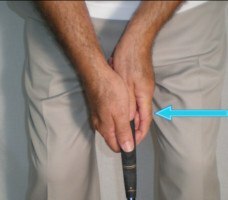 There’s no discernible tension in his hands or forearms, allowing him to stroke every putt smoothly. Haas doesn’t clasp his hands so closely together as to diminish his feel, but still achieves a classic arms and shoulders stroke with little to no wrist action. With fundamentals like these, Bill Haas should maintain a consistent leaderboard presence for many years.